Psst. I know what everyone is really hoping you’ll cook this weekend, and I’m sorry, it is not that kale salad. Okay, maybe not if these people are gluten-free, or opposed to butter, burnt sugar and stretchy yeasted breakfast treats. You probably shouldn’t make this for anyone on a juice cleanse or auditioning a paleo lifestyle. And now that I’ve ruled most of the people on this earth out, maybe I should stop talking about “everyone” when what I really mean is me. I have never been to Belgium, but the further I get along in this whole incubation process, the more I predictably long for the kinds of trips that will seem impossible to pull off for some time. I’d like to have an ale, probably two, in some ancient cobblestoned courtyard, eating pommes frites (RIP, sigh) from paper cones and then stumble around Bruges, gazing at canals and medieval architecture, eating my way through one stand after another until only the first paragraph’s kale salad will save me. My unsatisfied wanderlust has not stopped me from forming an obsession with the dense, chewy and caramelized brioche waffles known as gaufre de liège, which have about as much in common the “Belgian” waffles we grew up with at IHOP, as, well, IHOP has to do with internationality. * Liège waffles are tiny, rich and intense; stretchy, layered and faintly crunchy within from embedded pearls of sugar and firm on the outside from that same sugar melted and trickling about the waffle iron’s grids to form a caramelized shell. It’s not the kind of thing you can have a single bite of and forget; do not plan to have an easy time going back to the pancake-batter-in-waffle-molds that were once a harbinger of a great weekend morning. 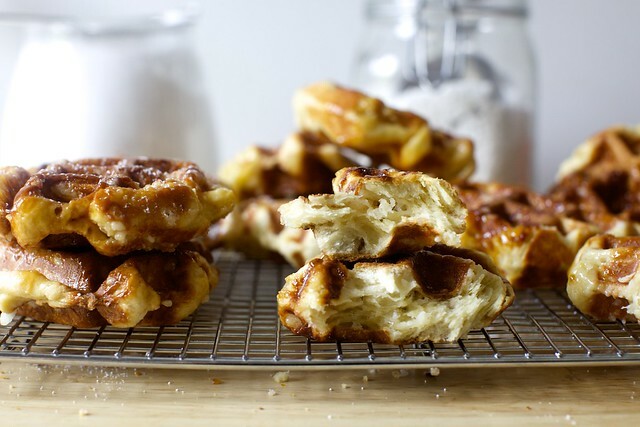 At their core, they’re an extra-buttery brioche dough given a luxurious rise before being studded with coarse sugar and scooped in doughy mounts onto a waffle iron. However, most of the recipes I could get my hands on were terrifyingly complex. I have little doubt that they’d make something transcendent, but if the process is so involved — say, the 90 minutes at room temperature then more mixing then another 4 hours, followed by 30 minutes, followed by an overnight in the fridge and another 90 on a counter of a well-respected and excellent recipe — that it results in no homemade liège waffles in your life, it has still on some level failed us. I did my best to streamline the number of processes, odd measurements and the extreme sweetness in many of the recipes to make a caramelized brioche waffle that is unforgettable… and also doable, and thus repeatable. Don’t even try to only make these once. * Although, 1) IHOP, I still kinda love you and 2) it’s not totally your fault. The Belgian waffles we know of in America are an oronym (word of the day alert!) of the “Bel-Gem Waffle,” the Brussels waffle vendor that brought them to American via the 1964 New York World’s Fair, and started something of a national waffles craze. “Bel-Gem” mutated into “Belgium” then “Belgian” and the name stuck. I’m obsessed with my new waffle maker: Over the years on this site, I’ve lamented that I didn’t understand why waffle makers didn’t come with removable plates. “Just wipe it out with a sponge!” everyone told me but omg, my last waffle maker had 360 channels and 240 keyboard-like bumps (you’d better believe I counted) and after December’s sticky gingerbread waffles, I swore off waffles until I either stopped caring about whether I was cooking on truly clean appliances or found a model that valued time not spent cleaning as much as I do. I ultimately found two: the first (a tip from several readers, thank you) is Cuisinart’s Griddler, for which you can buy additional waffle plates (rather steeply discounted on Amazon right now). Everyone seems quite happy with the product, and the system would have been perfect… had I desire or need for a Griddler. So I bought the second one instead, a simple model from Hamilton Beach that has proven so easy to use and clean, I fear our waffle intake has increased tenfold. Thus, consider this a product recommendation and a warning. :) As always, not sponsored. I’m pretty sure these waffles can be described with a Zagat-style collection of every one of my dessert trigger words and phrases: caramelized, chewy, burnt sugar caramel, stretchy, buttery, reminiscent of a croissant, doughnut and brioche at once. But don’t let that convince you; try them for yourself. I did my best to streamline the ingredients and processes in a way that would make these doable but also uncompromised in flavor and texture, making them two ways: one with a countertop rise followed by a long nap in the fridge and one in the reverse, in hopes to accommodate all of our schedules. While the process could be sped up further by skipping the cold overnight rise, you will be absolutely bowled over by the depth of flavor (and aroma, swoon, of the steam releasing from your waffle maker alone) that comes from giving the yeast more time to develop. Finally, I did not try this with instant yeast, but have found in other recipes that you can replace one with the other, but that instant yeast takes a little longer. However, you do not need to warm the liquid. Makes 16 thick waffles, just about 4 inches across each. Make dough: Warm milk and water together to lukewarm, or between 110 and 116 degrees F, and place in the bottom of a large mixer bowl. Add sugar and yeast and stir to combine. Set aside for 5 minutes; the yeast should look foamy. Whisk in eggs and vanilla, then stir in all but 1 cup flour (you can eyeball this) using a spoon or the dough hook of a stand mixer. Add the salt and mix to combine. Using the dough hook of a stand mixer, add the butter, a spoonful at a time, thoroughly kneading in each addition and scraping down the bowl as needed before adding the next until all of the butter has been mixed in. This is always my least favorite step in brioche because it feels like it takes forever to get that butter worked in, but it pays off in a stretchy, layered dough, promise. Add remaining flour and knead with dough hook on low speed for 5 minutes, or until glossy. 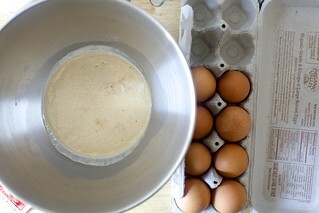 For room temperature first, cover bowl with plastic wrap and leave at room temperature for 2 hours; dough should double. Stir with a spoon or spatula to deflate into a mound, re-cover with plastic wrap and let chill in the fridge overnight, or up to 24 hours. For fridge first, cover bowl with plastic warp and leave in the fridge overnight, or up to 24 hours. The dough will not look fully doubled when you take it out. The day you’d like the make the waffles, bring the dough back to room temperature for 60 minutes, stir to deflate, and let rise again for another 1 1/2 to 2 hours. To cook the waffles: For both methods, on the day you’re ready to make the waffles, knead in the pearl sugar. It’s going to seem like way too much for the dough, but it will taste perfect once cooked. 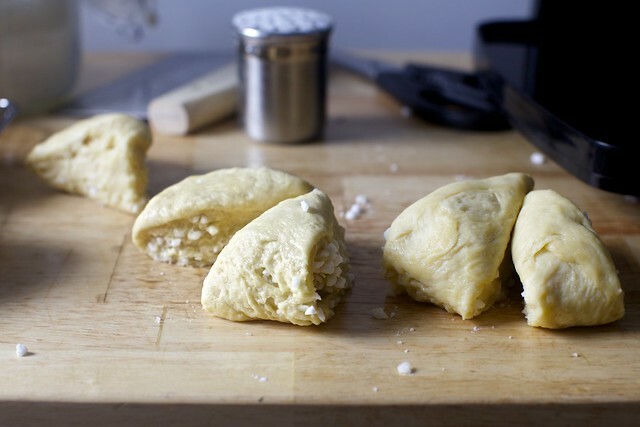 Divide dough into 16 mounds. If it’s rather warm and greasy, you can return these balls of dough to the fridge while you cook them off, one or a few at a time. Heat your waffle iron — I use a deeper Belgian-style one here, which is ideal, but I’d expect these to work with all types — over medium heat. No need to oil or butter if it’s nonstick in good condition. Place first ball of waffle dough on grid and cook according to waffle maker’s instructions. Cook until deeply golden all over, which will take approximately 5 minutes, then carefully transfer with tongs or a fork to a cooling rack. Remember, they’re loaded with molten sugar; they’re very hot. Repeat with remaining balls of dough, adjusting temperature of waffle iron as needed to get the color you want. You’ll likely find that the waffles look more caramelized and glossy as you go on, as bits of melted sugar stay behind and gloss the next waffles; this is the best part. Keep waffles warm in a 200 degree oven if you plan to eat them right away. As the waffles cool, they will harden and you will likely think “what a ruse! What a terrible recipe!” but the hardness comes from that melted sugar firming up, and will soften again when you rewarm them. These waffles should always be eaten warm. To serve: You can serve these any number of ways: with ice cream or whipped cream, Nutella and/or sliced fruit but I adore them plain and always warm. There’s so much flavor, they don’t even need a dusting of powdered sugar to feel finished. Keep leftover waffles, should such a thing exist, in the freezer. If you’re making the full batch with the express intent of freezing them, you might want to cook them to half-a-shade lighter, so that when they’re reheated in a 200 degree oven, they won’t get too dark. Cleaning up: As you make more and more of these waffles, the melted sugar might pile deliciously up on your waffle iron. As I mentioned above, I’ve fallen in love with a waffle maker with removable plates and sure didn’t mind the ease with which I cleaned this up. But don’t fret if you’re stuck with the well, stuck, kind, even if it’s coated with hardened caramel because warm water melts sugar, 100% of the time. Thus, a rubbing even a non-abrasive soaked in warm water back and forth over any sugar-hardened bits will dissolve them. in Finland, sucre en grains in France] Honestly, I would have shared a recipe for these years ago had so much of the waffle’s loveliness not hinged on an ingredient that — should you not be still working through the kilo bag you bought at G. Detou in Paris in 2008, heh — requires you to seek it out. But with a little looking, you’ll find it many places: IKEA sold it for years; it’s not on their site but worth finding out if still stocked. Amazon has ample options. King Arthur, Sur La Table. New Yorkers, couldn’t find it on their site, but I’d fully expect NY Cake to carry it, and I understand that Kalustyan’s has in the past. LA, I think Sufars has it. Make pearl sugar: David Lebovitz — a man with such an impassioned following that the day he linked to a recent recipe on this site, two different parents came up to me at kindergarten drop-off to ask if I really knew him — gave me a great tip this week: crush sugar cubes into coarse bits to create makeshift pearl sugar. And here’s an even more DIY approach. I haven’t tested these out (see above: circa 2008 impulse buy) but I have a feeling they’ll get you close to what we’re going for here. Thank you for sharing! What should I do if I don’t have a dough hook or a stand mixer? I have a hand mixer? Wondering what waffle iron you use– and would you recommend it? I looked through your waffle posts (gingerbread, pumpkin, buttermilk) to find this. This is the first post I saw that mentioned it — the others just say you have a Cuisinart you don’t like and a Krups. One says lots of people recommend the Black & Decker G48TD. Have you thought about making an equipment section / tag? Thanks! I just found “stuffing waffles” on Serious Eats and definitely need a waffle iron now. I was worried because people say the removable plate ones don’t heat as well, but if it worked for you maybe I’ll give it a go. I totally LOVE all your recipes. Can’t wait to make these, awesome! You’re the Smittinis Kitty Kitchen girl I know! I will make this STAT. I’ve made the Gaufre de Liège recipe a few times and they are always amazing, but require a minimum three hour nap later in the day to sleep off their effects. Can’t wait to try these. Oh, and @Sasha – I don’t have a stand mixer either, but I’ve found it works fine just stirring in the ingredients with a wooden spoon or spatula and mixing in the butter with my hands. It’s messy and it takes a bit longer, but it works just as well. Those are truly triggering dessert triggers words, Deb and I have been to Liège and have eaten waffles there. So thanks a million while I say bye-bye to moderation this weekend – just kidding, I already thought about a cake, so, not your fault then…this time! Hope you are doing well, I need to catch up with the last posts and I read pie somewhere. That looks grand and all, but for Mother’s Day weekend, I’m hoping someone else will make *me* breakfast this time! Wow, this really takes me back to Belgium or that one food truck that I use to chase around L.A. Much more convenient to make at home. Thanks! I just said out loud at the post, “Whaaaaaaaaaaat…?” And now I need to go downstairs to make this. Mind you, I’m home alone right now. I’ve been looking for a good liege waffle receipe – I even have the pearl sugar in my pantry already! I didn’t get my annual business trip to Brussels this year and have particularly been missing the warm liege waffles from the train station each morning. Now I know what I’ll be doing this weekend :). I NEED A WAFFLE MACHINE RIGHT ABOUT NOW. I love that I can make the dough, but still have a fabulous breakfast in bed the next morning. The perfect Mother’s Day recipe!! This has me craving these amazing waffles for lunch! Something this delicious can be on my menu any time of the day! I am so excited! We lived not far from Liege for several years and reading the ingredients made me think of the wafel stand in Masstricht and the amazing smell of fresh suiker wafels. Once cold they are also dipped in good melted chocolate and let to set (one half is usually dipped like the top or one side). It was a favorite in our family and I could never buy enough! They almost never made it home from the local grocery. I never found a recipe in English because I always searched in Dutch or French, never thought to search in English! Such a pleasant surprised to see this today and plan to make as soon as I find the waffle maker. these look amazing! and really well written piece as well! Thank you again for all the links you provide for us…the 1964 World’s Fair will take me hours, ( and “take me back” as well) the DIY Pearl Sugar and the photos of Bruges ( and all the waffles)) were bonus gifts that nobody but you links for us with such charm and humor. Not to mention demystifying the original Liege recipe, which allows us to actually eat them!!!! P.S.That young man sitting under your dishwasher is WAY grown up looking…big brother material for sure! You will be shocked at the juxtaposition of the new baby and the “other” baby for sure. My lil NYC apartment has no room for me to get a waffle maker, but I’m a big fan of all things yeasted. This may be crazy, but how do you think the dough would react if I tried to make pancakes with it? Is it too thick? This looks awesome! I have an older waffle iron where the wells are shallower and have far more of them than the Belgian style makers. Do you think I’ll still have success? when ample hills refers to “deb’s crack cookies” on their menu, are they referencing you?? I all but shrieked with excitement at the prospect of you + excellent ice cream in the same pocket of my brain. I live in Belgium. The smell of these waffles from vans in the street is obscenely delicious. I’ve often walked past and thought you would love them! As long as I live here it’s the one baked good I’m not going to bother trying to make, but this recipe will be great when I move. In the meantime I’m going to get one from a van on the way home. Thanks for the inspiration for once not to bake but just buy! Liege Waffles!! I love these and really look forward to testing out your version. Cleanup-wise, put a soaking wet piece of paper towel into the waffle iron and just leave it there til the unit cools off completely. Don’t try to do anything to it til it’s cool, that’s an easy way to burn yourself. Really feeling the need to scrub? use an old toothbrush, and run it though the dishwasher to clean it. These look amazing! I will have to find just the right time to make them. They make me think of the “Belgium or Not Belgium?” segment on the podcast Good Job, Brain! – which makes me laugh every time. Can this dough be frozen? Hi Diane, I just listened to an old Alton Brown podcast yesterday (the genius behind Good Eats) and in response to the same question from a listener, he said you shouldn’t freeze waffle batter because it loses too much gas. However, he said cooked waffles freeze beautifully, and that you don’t have to thaw them before reheating (but if you do thaw them it’s not a problem.) He said he reheats them in the waffle maker, being sure to get each one to line up with the crevices. Apparently reheating in a toaster is an option as well. ahh! blessed be my poor dieting eyes!! maybe just one. or two. or three? FYI – I’ve used coarse sanding sugar in lieu of pearl sugar in a pinch – it holds up pretty well in doughs w/o melting. I know, I know this is not strictly about THESE waffle,s but it IS about waffles! Your buttermilk ones, to be specific! We seriously want to do a wedding shower brunch, in about 6 weeks, that is a waffle bar. Is there ANY WAY AT ALL that waffles will still be delightful if we make them ahead and freeze them, then reheat in the oven? Yes, ideally, they would be piping hot for each guest, fresh from a line of waffle irons, but that is just not feasible. Help me, O Swami! Hi Renee, I just posted this response to a very similar question from Diane above: I just listened to an old Alton Brown podcast yesterday (the genius behind Good Eats) and in response to the same question from a listener, he said you shouldn’t freeze waffle batter because it loses too much gas. However, he said cooked waffles freeze beautifully, and that you don’t have to thaw them before reheating (but if you do thaw them it’s not a problem.) He said he reheats them in the waffle maker, being sure to get each one to line up with the crevices. Apparently reheating in a toaster is an option as well. In my own opinion, I would think a hot oven would work for a large quantity, maybe putting them on wire racks instead of sheet pans for better air circulation. thank you, thank you, thank you for doing this recipe! i had liege waffles when i was in belgium and became obsessed with the texture of the waffle and the crunchy sugary bits. i went home hoping to re-create them and found all the recipes to be over involved and none of them consistent, so i’ve only made them once. thanks for this version i cannot wait to try it out. i think i read once that turbinado, or another course sugar might be used in place of pearl sugar in a pinch. any thoughts? thanks!! Waffles and Dinges waffles! They’re my favorite food truck in all of NYC! We discovered them on vacation a few years ago. My husband and I were going to pass them up because it was close to dinner time but once we got hit by the waffle-scented exhaust, it was all over. Please, please do yourself a favor and smear spekuloos/Biscoff all over one of these bad boys. Renee – I’m not Deb, but I find that waffles are actually *better* when they’re frozen and reheated, at least if you value crispiness. I’ve never made her buttermilk waffles, but I make the Waffles of Insane Greatness from Food52 (secret ingredient = cornstarch, for extra crispness) and freeze them all the time. We throw them in the toaster, but they should be just as good in the oven. As someone who doesn’t care for beer, Liege waffles are the greatest expression of my Belgian heritage. I didn’t need a Liege waffle recipe, but I’m so grateful to have clicked through. As tasty as a perfect waffle is, it’s not quite enough to make up for having to later labor over a waffle iron encrusted with burnt sugar. The endorsement of a waffle iron with removable plates is what I needed. Oooh. I bought myself a waffle maker in fall (nonremovable plates, but still LOVE) and I have been dying to make liege waffles but was intimidated. Your version looks perfect. Hi Deb, thank you so much for sharing this great idea! It looks very good and I will tray it this weekend! Alison! Thank you for this! We do have our hearts set on a waffle bar brunch for this, my first grandbaby’s shower (! ), but we also want them to taste awesome! THANK YOU! Without a dough hook/stand mixer — I’m pondering this. The quick/easy answer would be to melt the butter, and add it (cooled!) with the wet ingredients. But there will be some compromise in texture; it may seem less layered inside. You could also make a big old mess of your hands and counter (for a good cause, obviously!) by kneading the chunks in by hand. I’d do a lot of flattening, dropping in a chunk of butter, folding the dough over it, and kneading it that way. I do think it will be worth it in the end. Thinner waffle irons — I’d expect it to work, but it’s a little trickier to get that three-part texture — crisp, stretchy, then crisp again. Maybe go a little easier on the color to be safe. Rhianna — It might be worth finding out. I’d cook them on a low-ish temperature and press them so they aren’t taller than 3/4- to 1-inch. Diane — I’d freeze it without the pearl sugar, only knead that in as a last step. You wouldn’t want it to dissolve before hitting the waffle iron. Staci — I’m devastated because I know that this neighborhood is no longer the kind of place where scrappy Belgian fries stand can afford rent. Also: friiiiites. Basically a desert island food for me. sfbeee — Not that I know of! But thanks for the reminder that we need to get there this summer. Carolyn — I wouldn’t expect turbinado to work the same in these; it’s not nearly as big melty. I might go the crushed sugar cube route instead. Alison — Ooh, I’ve been wanting to try them; glad to hear they’ve been a hit. Like I said, this new waffle iron I bought has definitely been “bad” for our waffle consumption levels! You know that phenomenon where you learn about something you’ve never heard of before, and then you hear about it again and again? Well, I just listened to the Sporkful podcast about waffles a few days ago… and here you are with a Liege waffles recipe! Crazy. Anyway, you might enjoy the podcast episode if you haven’t already heard it! And I will have to try your recipe! Looks delicious! Junglewife — That is so funny. Last week, someone told me I might like the podcast as they’d talked about Derby Pie. I still haven’t listened to it — honestly, I just don’t have a commute anywhere, so I don’t have that space of time most people have to listen to podcasts, I’d otherwise be all over them — but I love that we’re on the same wavelength. As a Belgian (and long time fan of your blog, fyi) I just want to say I’m PROFOUNDLY grateful that you make the distinction between your Belgian waffles and my Belgian waffles. :D <3 I can't tell you how many times I've had to convince people of the difference. Liège waffles are divine! The best are the ones you can get from one of many small shops in Belgium, encrusted with pearl sugar, and topped with diced fruit and ice cream. Très délicieux! Obsessed with sourdough waffles lately. Any thoughts on using that for your yeast? ^ Juice cleanse. And I’m crying inside thinking about all the waffles I can’t have. Being vegan or a raw eater, definitely not in my future! I can’t wait until I can have (controlled portions) of real food once again! Sigh. As one of these “gluten-free” folks of whom you speak (not by choice, believe me–celiacs of the world, unite!) I’m happy to make these for the mishpucha . . . but hate to slave over a waffle iron and cry into something as glorious as THIS that I cannot taste. Especially since I cannot then clean, then reuse, said iron to make something for myself. Which is why your recommendation of the iron you like–with the holy grail of removable plates! This actually exists? I’ve been looking for this, no joke, for a year!–has just been ordered. Thankyouthankyouthankyou, and a very Happy Mother’s Day to you!! PS–Made your Charred Broccoli with Lemon and Garlic the other night. We loved it. You can buy Lars pearl sugar (made in Belgium) on Amazon. Either individual boxes or bulk. It last indefinitely. I’ve tried to crush sugar cubes and it never works. Also seems to disintegrate in the batter in a way that the pearl sugar doesn’t. Belgian waffles in Belgium (the ones from the street vendors, not the ones ordered in a restaurant) are THE BEST IN THE WORLD. I have not yet been successful in duplicating something that tastes so good as a Belgian waffle like the ones in Belgium. I will certainly be giving this one a try. Thank you very much for sharing! It feels cruel to say this but was just in Bruge on Tuesday doing much of what you described! However, we head home in a few days and this will bring us back to beautiful Belgium! Liege waffles are simply the best and the first time I made them I almost swore them off forever due to the lack of removable plates and a whole lotta mess. I’ve been looking for a good waffler, so I’m glad you disclosed your love for this new one. Sold! Deb, you’re the best!!! I’ve been reading SK for years, and I’ve just moved to Belgium (as in I’m signing my house contract tomorrow). I’m so excited to have a recipe to try and make these myself! I will say the pearl sugar in the waffles here does seem different than what I was used to in the U.S., but probably the best approximation. We still have what Americans think of as Belgian waffle here, mostly in Brussels, with lots of toppings, but they are certainly dessert and not breakfast :) I realize your family is growing these days, but if you find yourself in Belgium know that you have fans that would gladly show you around!! Yeeeesss a waffle iron with removable plates! I kind of want a Griddler because of the panini press function, but this one is a definite contender. Whoa, these are like little bread waffles!! I love love love this! I went to two different cooking stores in Paris to track down pearl sugar so I could make these at home. I have only had liege waffles from the liege waffle truck here in LA. So then I bought the sugar, came home to LA, and made the waffles. The not good thing was how everything got stuck in my belgian waffle maker. The good thing would be your $40 replacement. Great idea. Now I can finally use the rest of my sugar! I found Lars Pearl sugar at Whole foods and I’m excited to try this recipe for Mother’s day. Thank you for sharing! You know, I’d take the dough out of the ‘fridge, roll it out on lightly floured counter in a large rectangle about 1/3 inch thick (or so) and then cover about 2/3 of dough with pearl sugar & press in sugar, fold over the 1/3 plain, then fold over sugared side (business letter fold! ); then lightly roll with rolling pin to kind of stick every thing together, THEN cut into 16 equal pieces. Then cover & bring to room temp (probably only need about 45 min.) and proceed as directed. I have actually made these. They were easier than I expected and turned out great. I only had some Swedish sugar (not as large as the pearls), but it was fine. I just put a dollop of dough in the center of my regular waffle maker so I ended up with roughly 3 inch circles. They are more of a sweet cookie, best eaten plain or with fruit. No syrup needed! Deb, my ex-husband (late 50s) is usually the guy manning the Wafels truck! Just mention that you know his daughter follows/worships your food blog (she turned me on to you) and he’ll give you whatever you like! It’s kind of funny; all his life he had a secret dream to do something culinary, and this is where he ended up. You’re my hero! I’ve been making these the hard way (90 minutes, 30 minutes, etc.) trying to recreate the amazing waffles I once had in Bruges, but this seems far more simple. I definitely will be trying these! I wonder if you only have one or two percent milk on hand, if you can just use 3/4 cup of it instead of the milk water mix? I am pretty impressed that you would try this even with an easy to clean waffler- but it sounds like any trouble is worth it! I love yeasted waffles and find that the Cook’s Illustrated overnight yeasted waffles are in another waffle world compared to the baking powder and do ’em up quick sort I have always made in the past. I use a 40 year old waffler that I hope never conks out! I love it , thank you for sharing. Mmm… I need a waffle maker. That bit about having an ale or two and stumbling around Brussels (and also Brugge) was my honeymoon, and it was wonderful. AHHHHHHHHHhh WHY. I have nine pounds of baby fat to loose and now THIS. FYI for any other Minnesotans, they have Swedish pearl sugar at Byerly’s and Lunds, Kowalski’s, and plain old Cub in the international section. I used to have a waffle maker but then it had like a bajillion things on it so I gave up (before starting) and lost it when I moved. But I was in Amsterdam a couple months ago and they sell waffles EVERYWHERE and I freaked out and need to make them again! Deb – I don’t commute anywhere either. :-) I listen to podcasts while my 8 month old twins nap, and I sit in the bedroom with them because they only nap for about 30 minutes and sometimes if I catch them when they’re just stirring, I can pat them back to sleep :-) So I sit and knit and listen to podcasts and it’s my little break even as I’m keeping an eye on the babies! Oh my, you MUST go to Brugges and go to De Garre ( http://www.degarre.be/ ). It is a hidden gem, down a hidden path between some buildings….have tripel (the MOST inedible bier), they even have half pints if you cannot drink a whole…they serve a delicious cheese with the bier, so yum, and it is kid friendly!!! After you’ve had a bier, wander into the square and have a Liege Wafel from the wafel guy there. He is in a little van, and makes the most AMAZINGLY delicious wafels EVER!!!! Just came back from Belgium and had a LOT of these – yours look even better! Thanks for the waffle maker recommendation…I finally had to throw mine out a few days ago (ergh uhh too much use…), definitely getting this one! Bless you! I lived in Belgium for a year and had just about given up ever being able to find/make anything that would be remotely as good as what I remember!!! So excited to try this! Junglewife — Ah! Perhaps in a few months then, when I hopefully have the delight that is naptime again. P.S. Have ALWAYS wanted to do a food/cooking/chat podcast but am already stretched a bit thin. It will fall into place one day, I hope. Deb- thank you! As I was wondering what to add to our wedding registry, I remembered a comment you had made earlier about an easy to clean waffle maker. So I searched your site to find where you’d mentioned it, found it, added it, and it just showed up as our first wedding present. But best of all, the day after it showed up, you post this recipe. I am sure this waffle maker & recipe will be my most favorite new wedding gifts- thanks to you! Deb, I think if I ate these, I’d die and go to heaven. PERFECTION!!! Oh Deb. Belgian reader here. If you once visit, please don’t limit your visit to Brugge. It’s pretty, but that’s about it. We have so much more to offer. Go to Gent. Eat Tierenteyn mustard. Buy candy at Temmerman. Eat mastellen – a kind of cinnamon bread you cut open, butter and sprinkle with dark brown sugar and then grill. Eat cuberdons. Eat the best vegetarian burgers of your life at Tasty Burgers. Try the pastries at Joost Arijs – you will never look at pastry the same way again. Overdose on chocolate in the Chocoladebar. Go to Brussels. Marvel at the chocolateries at the Sablon. Eat raspberry pie at Wittamer. Go to Dandoy for speculoos and pain à la grecque (kind of a dry equivalent for a liège waffle). Eat seafood at the Noordzee, standing by the counter. Try the croquettes crevettes. Go to Pistolet Original and eat the ones with eel and boudin noir.Try Belgian dishes at Nuetnigenoegh. Drink Kriek Girardin. Eat the pralines from Frederic Blondeel. Drink 50 kinds of pastis at the place jeu de balles. Eat moroccan pancakes at the sunday market at Gare du Midi. Go to Antwerp and Liège. Eat fries, stoofvlees, Brussels endive, asparagus, mussles, mattentaart, fresh grey shrimp, sirop de liège, smoutebollen. I dare you to google these things and not drool all over yourself. I really need to start using my waffle-maker more! Yum! Now all I want is a waffle maker to make these delicious looking treats! um YUM! OMG, YESSSSSS. I went to Brussels last summer and ate a Liège waffle at Dandoy and it was The. Best. Waffle. I. Have. Ever. Tasted. And I love waffles. Now I can try to make it at home! Thanks Deb! Love the recipe, but, since Liege is a city, you should capitalise it in the title. @Elke: yes! You make me miss my monthly trips to Belgium when G. and I were dating… And make me crave croquettes crevettes! Deb – if I let it rise at room temperature first, and then in the fridge overnight, can I cook straight out of the fridge or do I need to let the dough come to room temperature before cooking? I tried both Swedish and Belgian pearl sugar. The Swedish sugar did not caramelize at all – it remained hard and white. It still tasted good, but I’d definitely recommend using Belgian pearl sugar, which turned out great. You had me at waffle. Happy Mother’s Day you soon to be new mama! And thank you for the wonderful aroma wafting through my kitchen with maple syrup and powdered sugar on top! p.s. And oh, Lord, I did a 3 day cleanse and was soooo crabby! Just too hungry! Bring on the waffles! WHY pearl sugar like, the stuff is horrible (I live in Sweden and can get it easily, but Dansukker hold a sugar monopoly and there is only one kind to be had). This had better be worth it. I do have approx six packets of the stuff since I kept buying it at one time thinking I didn’t have any when it was ICING SUGAR I didn’t have. And I only used it to sprinkle on cinnamon buns once in a while, so pointless. Now I’ve stopped doing that because I’m not that keen on the crunchy sugar on top of buns at all, and years ago they changed the way it was made so that whereas previously pearl sugar on buns would melt a little and caramelise it (which was ok because the burnt bits were nice) now it just stays PURE WHITE and CRUNCHY on top of the buns for decorative purposes and it’s not as nice at all. Decoration should never come before taste. So basically, my instinct would be to avoid the stuff, at least if it comes from Dansukker, because it doesn’t feel like it’d melt in the dough and caramelise at all? Authentic pearl sugar can only be gotten by ordering through the Chicago Import Company or the like. It comes in bulk, but you’ll want that much, because it is essential to making real Liege Waffles. Without it, it just doesn’t compare. 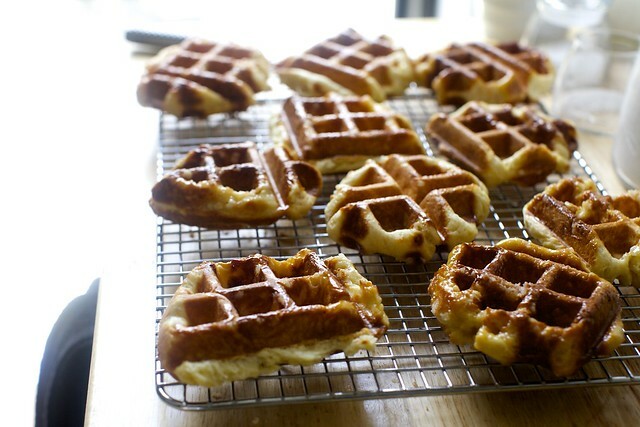 The waffles look yummy, and I hope to make them someday (on my great-grandma’s circa 1890 German cast iron waffle iron! ), but the main reason I am posting is to thank you for your RIP to Pommes Frites. I live in the East Village, and that had been a go-to place for me since they first opened; their loss – as well as that of the other stores, buildings, tenants, and above all the two men, four cats and one dog – has diminished the neighborhood, but hopefully PF will be back, as they have promised. On another note, happy Mother’s Day to you a bit in advance! These waffles sound insanely delectable, and I’ve made sure to order my pearl sugar before that can get sold out, too! And sadly – have been mourning Pommes Frites since the fire. I can’t see them coming back, can you? More information about the waffle maker please. I recently bought one and don’t like it and I want to try not to make another mistake. What is the model number of the one you purchased? Why did you pick this model? Why not one that makes more than one waffle at a time? Francesca — The problem straight from the fridge is that the very buttery dough is quite firm and wouldn’t be easy to knead in the pearl sugar. It’s best to let it warm and soften a bit; this usually takes up to an hour, but you might be okay at 30 minutes. June — I picked this waffle maker, as I mentioned above, because it has removable waffle plates that are dishwasher safe. That’s the whole reason, I mean, once I established that reviews were good and it worked well. I found only two waffle maker with removable plates in existence, this and the Griddler, but the Griddler has many more parts because it’s more than just a waffle maker. It only makes sense if you also want to own an electric griddle/grill. The one I show here is Hamilton Beach 26030 and it’s available from a lot of stores online, mostly in the $40 to $45 range. Can you imagine the wonderful semester aboad I had another life ago? I spent it in Bruges and it was every bit as magical as you have imagined. It really was full of chocolate and pastry shops and pommes frites stands. And the waffles….oh the waffles. Thanks for the memories. I will make these this weekend and dream of years past. Oh, B&H?!?! I hadn’t realized they had to close; though I know there are super-close to it all. It’s all so terrible. What if you did not use the pearl sugar at all…in other words, if you just baked off the dough and used some sort of syrup or jam? Would these be worth making that way? Just curious…have never eaten anything like this sort of waffle. Still tasty, maybe? I am torn between writing this comment and running to my kitchen to whip these up – I seriously have a huge love affair with these little guys! Thank you so much for posting this recipe! Well, this is the second recipe this morning that i’ve seen for yeasted waffles. I guess I know what I’m having for breakfast tomorrow! No pearl sugar today, so it will probably be the other waffle recipe first, but I had the opportunity to taste a liege waffle a few years ago and it was awesome. Definitely worth a special order of sugar! Deb – When are you due? Oh, Deb, thank you! I am inspired to craft my best Mother’s Day present ever, with you as the centerpiece. Nancy– best friend, soul mate, brilliant pianist and shimmering intellect–and I spent many Saturday mornings of our careless youth wandering the Upper West Side in NY in search of sweet breakfast perfection. With Bacon. History, memory, love. Your writing! Your waffles! Amazon! Zingerman’s! (their house bacon, OMG) Sending your post and all the fixings today, with a promise of a visit to make her breakfast. Deb–you, like Nancy–are poetry in motion. Since you mentioned waffles, have you seen this site and/or book? 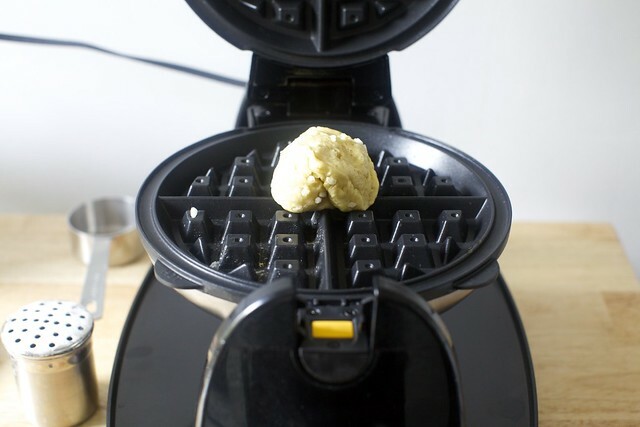 Looks like some fabulous ideas — pushing the waffle iron where no waffle iron has gone before. Literally dreaming of these beauties. Can’t wait to make them soon! Have you seen the hilarious dark movie In Bruges? You should Netflix it right away. Wauw!!! This looks sooo yummi! Reporting in to let you know that YES New York Cake has pearl sugar, in 4 ounce packets for $3.99. I bought one. The guy in front of me at the register bought three. Only when I was nearly back to my office did I realize that I too should have bought three, because one is not going to get me a cup and 1/3 of pearl sugar. I am, apparently, an idiot. But I thought you’d be amused that clearly he was also about to embark on the waffles. I wonder if New York Cake wonders about the run on pearl sugar. Several years ago my husband brought home a jar of waffle and dinges spekuloos spread (his was way before you could find it on every grocery shelf) that a friend bought for him. He told me about the liege waffles and I decided to do a little research and found a few recipes. As you well know what sets them apart is the pearl sugar. I set out to find it, not an easy task that took years. I did not want to buy it online since the said waffles would wind up costing a small fortune. Ikea stopped carrying the sugar years ago and i read the sugar cube tip and would you believe that it is just as hard to find them as the pearl sugar. Well after I finally found the sugar I made the waffles (spread was long gone and I was now making our own)and they were a hit with all but three of the kids. I am looking forward to giving your recipe a try and now that I know where to buy the sugar (sadly not local) it might only take us a year to get to it. I’m paleo but this is a total cheat worthy recipe! HELP! Belgian pearl sugar or Swedish? They have both on Amazon. I need to buy ASAP so I can make these next week! Hi Deb, I discovered my love for Liege Waffles three years ago when I wandered the cobblestone streets of Bruges, gazing at canals and eating my way through waffle stands. And the kicker … I did it with a three month old baby! Just because you are incubating doesn’t mean you can’t get there soon. Later that year my husband bought a waffle iron and pearl sugar so I could have these without the jet lag. I’ll definitely try your recipe soon! Deb, I just want to tell you I LOVE YOU for posting this. Off to source a waffle iron! Deb, only you can make me consider getting a waffle maker. Wow. These look… just…luscious… [*wipes drool from chin*] Girl, you are the worst thing that’s ever happened to my waistline. True confession time. My husband travels to Belgium from time to time on business, and I have been fortunate enough to tag along twice–but I have never eaten a waffle there! Clearly, I need to go back. On the other hand, every meal was a terrific meal. We have a Belgian friend who gave us a great cookbook called Everybody Eats Well in Belgium–and it’s true. I second Kelly #110 and her recommendation of the noir comedy “In Bruges.” We watched it saying every two minutes–oh, we were there! I am very glad you posted this recipe. I ran into this http://volkswaffleca.net/ at our little farmer’s market and he said it was impossible to make the dough here, that it was necessary to import. I couldn’t quite understand that reasoning. Question — I was recently at NYC Cake on a frenzied shop and bought the cute little sugar shaker in your photo. The perfect size and perfect hole size for larger sugar grains but how do you keep the lid on tight? If I get it on just so it is good but touch it ever so slightly and the metal lid is loose. Make waffle dough tonight and enjoy tomorrow. I buy my pearl sugar at an international market. The recipe on the back of the box of Lars Pearl Sugar is perfect and takes less than an hour to buttery, yeasty perfection. To get the burnt sugar off my non-removable plate iron, I lightly soak the bottom in water (without submersing! ), then flip it over and do the top. Warm water will dissolve all the burnt bits. This was excellent timing as I just acquired a waffle maker of my very own. We used whole wheat pastry flour since that’s what we had on hand and sucanat (unrefined evaporated cane juice) which has a texture quite similar to pearl sugar. It worked great! Sucanat still contains molasses, so it added a wonderful extra note of dark caramel. Admittedly non-traditional, but so very delicious. Will the 2 hour rise time be affected by the temp in the house? And it seems I should start this process the day before I want to serve. Since it’s almost 9 am on Saturday, I’d have to start it now for breakfast Sunday correct? AMAZON has plenty of pearl sugar pretty well priced but they do take forever to ship now if you don’t sign on to their prime. gah! Happy Mother’s Day UBERMOM. This recipe looks stunning and I”m definitely going to give it a shot (as soon as my sugar comes in). I love Liège waffles! Like a lot of people, I had them for the first time at the Wafels & Dinges truck when I was in NY :) it was love at first sight, I can still remember the delicious smell! Just remembering it brings a smile to my face. I went to NY again last year and must have had their waffles about 4 or 5 times, I just couldn’t resist walking by their truck and not having one! I did try making the waffles at home once, over a year ago, and while they were good I thought they were too buttery, almost greasy. I’m gonna have to try your recipe! I did use crushed sugar cubes instead of the pearl sugar (it’s impossible to find in Brazil and the shipping cost would be too high to buy from amazon), and it worked out just fine. 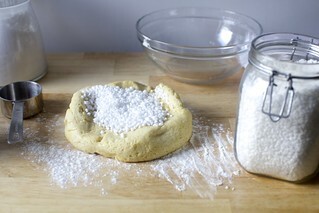 I have the dough resting in the fridge right now, and I just made pearl sugar using a recipe I found online (it was actually pretty easy to make). Can’t wait to make these for my wife tomorrow. Our kid is the furry variety, but to our dog my wife is mommy. FINALLY!! 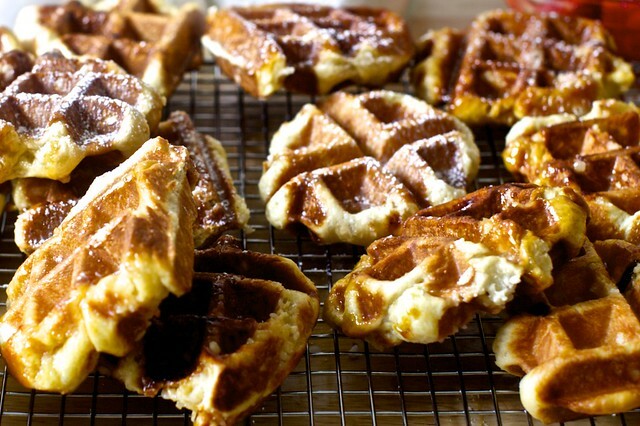 A liège waffle recipe that looks like the real deal! I’ve tinkered with and tried so many versions with nothing to show but disappointment and flaccid waffles (the real deal is one of the world’s greatest food inventions in my opinion). Dying to try this. Thanks for doing all the tweaking! Hi Deb, I’m from Belgium and yes please come and visit! You will find Liège waffles everywhere in the city streets, they bake them while you wait. Eat when still warm… bliss! PS: do not only visit Brugges, Ghent is even nicer. These look so good! I have joined you in the incubation process and even though it’s only been a few weeks since I found out I already miss having a delicious ale at the local pub. And sushi. I swear I want it more just because I can’t have it! Always excited to try a new waffle recipe and these look SO delicious. Thanks, Deb! hello Deb, hope your having a great Mother May, I know that I sent you a first message but the Google talk doesn’t come out what I was asking you , so now I just wanted to know if I can skip the pear sugar because I can’t find it and for the two rise, let it rise twice ? but one or the other? (For room temperature )or (the fridge first)? Never in my life have I craved waffles, until reading this post. I’m in big trouble now, Deb. I’ve already powered through the salted chocolate chunk cookie dough into the freezer! As penance for that indiscretion, I’m offering another pearl sugar source for those who live in or wander through the West Village. Sockerbit is a Swedish candy store on Christopher Street that sells pearl sugar and other goodies, too. It’s a gleaming white store, which just shows off all the different gummy candies as if they were jewels. It’s a lovely spot. This recipe sounds delicious! However, I wanted to make a brief note regarding the culinary history of the Belgian waffle, which you mention at the end of your essay header. The introduction of the Belgian waffle to America actually pre-dates the 1964 New York World’s Fair. In 1958 at the World’s Fair in Belgium, Walter Cleyman––at the age of sixteen––introduced the world to a fluffier, lighter waffle, which contained beaten egg whites and yeast (1). In 1962, Cleyman brought his waffles to the Seattle World’s Fair, where he sold over 500,000 waffles (2). Fair goer Mildred Whiteaker praised the Belgian Waffle: “Prepared in a Belgian manner, they’re sprinkled with powdered sugar, ‘stuffed’ with sure-nuf whipped cream and smothered with fresh strawberries. They cost 99 centers – and worth every calorie.” (1). Many New Yorkers like to claim their city is the home to the Belgian waffle, but the waffle’s introduction to America dates back to the Seattle World’s Fair. Vermersch, the man who sold these waffles in New York at the 1964 World’s Fair, called his waffle the “Brussels Waffle,” but nobody knew where Brussels was, so he changed the name to “Bel-Gem” waffle (1). The Belgian waffle was likely first introduced to America in Seattle but its popularity grew at the New York World’s Fair. Tracking culinary history is tricky, but newspaper articles from 1962 document the presence of the waffle at that fair. We made these for dinner last night and they were everything I ever wanted in a waffle. As good as the ones I used to buy from a stand for $3.50 each, or possibly better! We used the DIY pearl sugar method and it worked wonderfully. We also used our new stovetop Nordic Ware Belgian waffle maker. It wasn’t high-maintenance like I thought it might be, and it takes up so much less room in the cabinets and was easier to clean than our old electric one. I had these with a miso caramel sauce once—possibly even more delicious than they are plain! I need Purl Sugar stats is there a service dose anyone deliver? Help, I can’t wait till tomorrow to go Ikea this looks awesome! I grew up in Switzerland and we put Hagelzucker on EVERYTHING. When we moved back to NYC, I brought along so much of it! I put it on babka, muffins, french toast and pancakes. Its possibilities are limitless! Only thing I’ve never done are liege waffles. Not for lack of want, but we don’t have a waffle maker, and there’s just no place in the kitchen right now. One day soon! In Francy pants, my host family used to feed me these waffles wrapped in plastic from the store that had a crackle in them and one side covered in chocolate–my god they were delicious. And I think you may have given me a recipe that has the crackle plus 1 million more reasons to eat them. Thanks!!!! Dear Deb, I’m a Belgian food writer/restaurant critic and if you ever happen to plan a trip down here, be sure to contact me and I’ll be glad to cook a meal for you, show you around or help you get the most out of it! Swedish vs. Belgian pearl sugar — Belgian is the first choice here if you have access to both. (See a’s comment.) Swedish pearl sugar pearls are supposed to be a little smaller. However, Cynthia says that the Swedish worked just fine for her. Making the dough in a breadmaker — I have very little experience with breadmakers but if you have a good recipe for brioche that works in there, you could use the same instructions here. The main thing is that you’d want to add the pearl sugar right before putting them in the waffle iron, not too much sooner or the sugar may dissolve. Rosa — The pearl sugar gives these waffles their signature texture and flavor. However, I offer alternatives, from sugar cubes and homemade, if you cannot find it. Without the pearl sugar, it’s just a brioche waffle, and not very sweet (the sugar is kept very low in the dough in anticipation of the sweetness the pearl sugar adds). It may still taste good, but it’s a different sort of waffle, not likely to be chewy or crunchy. There are two ways to let this rise, fridge first or counter first; both work. JP — See above about the what the pearl sugar adds. Gail — Thank you, I have never been there! Sounds like it would be a fun place to check out. Any favorites from the shop? Jeffrey — Thank you for all the information! Lori — Yes, the book and site are really fun. Kathy — I’m due in early July. Thank you You Deb for getting back to me. ..
Do you think that brickle or toffee bits would work instead of the pearl sugar or would they not dissolve enough while cooking? Those are readily available at any grocery store. Has anyone tried making these in a regular (non-Belgian) waffle-maker, to confirm that the texture still works? Thanks! Liege waffles! This post both makes me nostalgic and sad. I used to work at a Liege waffle stand in Columbus, OH, and the waffles were indeed magical; there was nothing like eating one hot from the iron with a dusting of totally-unnecessary powdered sugar. Or with Nutella and berries. Or with a fried chicken cutlet and a bit of hot sauce! But gods almighty, was it ever a terrible place to work. So, based on that, I have two notes on this recipe even though I haven’t tried it yet: at the shop we never did a room-temp rise; we just mixed up the dough, kneaded in the pearl sugar, divided it into balls, and refrigerated them overnight. We’d take them out at least a half-hour before baking, and they baked up beautifully. Might be worth a shot! Also, regular waffle iron will result in a thinner, crisper end product. You won’t get as much of that marvelous chew in the middle. never posted before, but have been craving these for years; I even bought a belgian waffle iron but it didn’t help. Your recipe is the real deal; we are thrilled. But I must add that I don’t have a kitchen aid, so I just mixed the batter with a wooden spoon and hand-kneaded in the sugar and it still worked fine. Everytime I try something new in the kitchen, my family knows it is a smitten kitchen recipe, these days. I have made these using one of the recipes you used in your research. They are amazing. We do have a decent café that makes these too. I have the big, double sided KitchenAide Belgian Waffle iron. It’s a great waffle iron, but it does not have temperature control. I make due, but these waffles are best made in an iron that can be turned down to medium. The KitchenAide gets super hot which is great for crispy waffles (and latkes, and hash browns, and churros, and cheese puffs…). But that level of heat will burn the sugar. The pros use irons that can be turned down to the neighborhood of 320-350 F. This allows caramelization without getting too dark too fast. I’m pretty sure mine gets up around 400-450F. Also, don’t know if it was mentioned in the comments, but I know you’ve written about the Will It Waffle? cookbook. I follow his advice for cleaning my iron using a Bisquick waffle to pull sugar, cheese, crumbs, oil, etc from the nooks and crannies. I lived in Belgium for three years and loved the smell of these. Liege waffles are totally different to Belgian waffles which are topped with various toppings. Liege waffles are usually a snack and not eaten for breakfast. To reheat pop them back into the waffle iron until warm, this is what some vendors do in Belgium. As for making them in the bread maker, just don’t add the pearl sugar as it gets caught under the blades and scratches the bottom of the pan. My recipe came from the book Dutch and Belgian food and Cooking by Janny de Moor and Suzanne VanDyck. It simply mixes the dough, rests for 30 minutes adds butter and pearl sugar then refrigerates over night. Roll into balls the next morning and cook for three minutes. All the hard work done the day before! Deb, might you consider never again mentioning Amazon, which has done terrible things, especially to the publishing industry? I swore off them personally last year. so funny – when i was pregnant with my last child (very much planned and wanted!) i immediately started to crave travel. odd how that happens. now that she’s 15 months and i can take her out i am happy to stay home! these waffles are glorious! i have had them at restaurants but never tried them at home. thanks for cracking the code! Hi Rosa — Yes, there is a full section at the end of the recipe [“Finding Pearl Sugar”] with links to this source and many others, if you’re looking to order some online. The Lars brand seems popular with readers. Susan — YUM. I mean, they would definitely work/taste differently but I don’t think it would taste bad here. Please let us know if you try it. MR — Ah, I always wondered why this doesn’t come up more often in the comments. So, there are a few things at play here on the site and I plan to bore you with each of them, now that you’ve asked. :) The first is that once I became a book author myself, I ceded some of my freedom to pass shade on booksellers. I may not love their impact on the publishing industry as a whole, but they’ve also sold more of my cookbooks than anyone else, and promoted it far above and beyond what they “had” to. There are a lot of book authors in this boat; cautious about the company’s dominance but also not ungrateful for making their books so easy for people to get. That said, I’ve always been extremely careful on this site to equally promote all outlets selling my book; the sidebar book link does not go to Amazon (as is does on most other sites that have a book to sell), it goes to a page that lists stores, small and large, where the book can be ordered online and people can choose for themselves where they want to shop. So, that’s the book author angle. Then there’s the site scope angle. The fact is, this is where most people are buying their books, and their batteries, and their waffle irons and in many smaller towns, they’ve made it easy to get things (like obscure Belgian sugar) that might have been previously impossible to get. While I have my own feelings about what this does to Main Street, I’m not here, on this site, in the business of telling people how to shop. I’ve never been comfortable from a perch of moral righteousness, nor is ‘how to be a more ethical shopper in a way that I find most ethical’ the focus here — it’s about finding your new favorite things to cook, and better ways to cook your old favorites. So instead, I strive for balance. When there’s a “here’s where you can buy this” link, I always try to list non-Amazon stores that also sell items whenever I can get my hands on the information, to make it easier for people who wish to shop locally without telling anyone what to do. I hope that adds some clarity. I’m happy to answer any other questions. Ikea actually sells the pearled sugar! I was at the Ikea in Atlanta on 5/9 and asked a food salesperson if they sold pearl sugar. She told me they used to years and years ago, but that they no longer sell it. Yum! 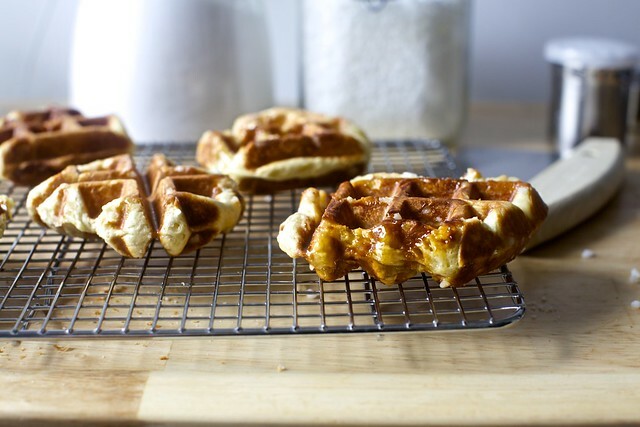 Waffles are one of my favorite foods, so I can’t wait to try this recipe! Thanks for sharing. I tried to make these for Mother’s Day but for some reason the waffles didn’t work out. Maybe my waffle maker. In any case, after I gave up I took the leftover dough and put it in a bread pan and forgot about it. Around 2pm I discovered it had risen and baked it in the oven for about an hour and ended up with a really delicious loaf of brioche that has been making perfect breakfast toast all week! Seriously, try it with Nutella. It’s amazing! Ohhhh my goodness, yes. There’s a place across the street from my office that sells these, exclusively. I’ve always thought they’d be so impressive and appreciated when I have overnight company, and now I am looking for a waffle iron of my own. Hi I want to make these for a bridal shower. Could I make them the night before? How should I store them? I was thinking of making these and then having some Nutella and speculoos spreads. And if I want to get over my head, maybe chocolate dip some and some red velvet ones! Your thoughts and guidance are deeply appreciated! HT — I think you can make them the night before. I might cook them on the pale side, so you don’t have to worry about them getting too dark or crispy when reheated. I am sure the Nutella and speculoos spreads will be welcome, but leave some plain. They really are wonderful with absolutely nothing on them, too. Best. Waffles. Ever. Loved this recipe and the smell…. oh, the smell coming from my waffle iron… it was amazing! Next time I’ll plan ahead and order my pearl sugar online (buying it from the uber-trendy health food store was $$$ – but still worth it to have these waffles in our bellies ASAP!). Great recipe! I live in Sweden and the Swedish pearl sugar worked perfectly. One question- for the refrigerate second method, could you add the pearl sugar to the dough before the overnight in the fridge? I had a hard time incorporating it into the cold dough the next morning. I am due with my second in a couple weeks and am terrified- somehow cooking and freezing delicious food like these waffles make it seem like it all might be ok. Thanks. We froze the dough on these — made them this morning and they were delicious. We froze it in balls. I just thawed the balls in warm water and popped them in the waffle iron. The sugary delightfulness wasn’t quite as prominiment as when we made them fresh, but they were still totally the bomb. I don’t have a waffle iron (because single-use item), but thought I’d try making these in a cast-iron pan as per #43. Did them on a medium-low heat and pressed them down as flat as I could get them (about 1/2 inch — they kept bouncing back). End result was a bit like a scone — a delicious, chewy scone with a caramelized crust — BUT because they were just that much thicker than actual waffles, the sugar nibs in the center didn’t melt at all, leaving a not-unpleasant crunchy inner layer. Made for a good brunch, but I might hold off trying this again till I’ve acquired a waffle maker. 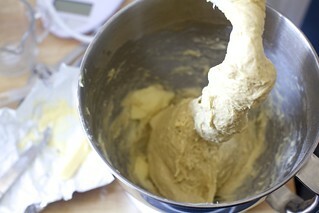 I also don’t have a mixer, but making the dough by hand is quite easy if the butter is really soft and melty. Thank you, Deb. I have had my bag of pearl sugar from G. Detou for five years! These waffles were a worthy use of that precious stuff. I had the real deal in Brussels a few years ago. Let your nose be your guide to locate a vendor. I also bought the pearl sugar at a grocery store there. They are amazing, but I remember the waffles being larger than what you have pictured. For the record, I have my mom’s round waffle maker which must be 30 years old, and I never clean it! It doesn’t have removable grids, but I clean around the edges where overflow may occur. I use a yeast dough batter. So delicious, and the grandkids love them. Just made them for Mother’s Day brunch. goodness, these look amazing. I only have a shallow waffle maker – heart shaped waffles. I wonder if this would work in it, or do I have to (oh, noes) get a new kitchen toy. Maren — The risk of adding it sooner is that it may dissolve before it gets a chance to melt in the pan… it can’t hurt to find out, but it’s definitely safest to add it at the end. My mixer is currently in storage but I valiantly forged ahead with only my hand mixer! Crazy woman! My arm felt like it should be twice the size next day haha! Totally worth it though. Lacking pearl sugar I used raw sugar, and I couldn’t work in all of it which is probably why mine looked drier and less caramelly than yours. Still, delicious enough! So disappointing that they’re no good cool. Hi Deb – I’m on attempt 3 of homemade pearl sugar while the dough rises (why is it never done before midnight when it has to go to work in the morning?) and I think I came up with another method. I mixed up the sugar and water in a ziplock baggie and squished it around, then spread the clumps out onto a rimmed baking sheet lined with foil and stuck it in my oven on its “Keep Warm” setting of 170F. I learned the hard way that I can’t keep a low enough flame on the stove (melt #1) and turning the oven to Convect Bake at 200F leads to melt #2. I let the second batch go for a while on Keep Warm and it looked like it was going to be just fine, so I’ll leave the oven on for an hour or so, turn it off, and leave the sugar in the cooling oven overnight. Hopefully that’s another option for people having trouble with the stovetop. Well, great. Now I’ve got to try these waffles I’ve never heard of and have NO idea how to pronounce. How do you pronounce them, Deb? Also, I’m already imagining altering the brioche recipe from Artisan Bread in 5 Minutes a Day to use as a starting point for this recipe so we can have them with less prep time given that I’m baking a little waffle bun this summer, too. Incubating humans need waffles while in utero, clearly. I’ve never commented before, but I’d also never heard of Liege waffles, and that didn’t stop me! I am on batch 2 right now (batch 1 was DEEE-LISH) and had a few questions. First off, what speed do you usually have your mixer on when you are mixing in the butter? And should it take 20 min to mix it in? (yikes!) And what kind of mixer do you have? I got the Kitchen Aid Artisan 2 years ago when I got married, and I have to say, I’m not a huge fan. I feel like it doesn’t get everything up from the bottom of the bowl, and it freaks out when I make a full challah recipe. Anyway, LOVE your blog and LOVE your cookbook (actually found your cookbook before your blog- was browsing in Powell’s…). A little tips to have a really good caramelized waffle (like you can eat in the streets of Liège) : put your dough “balls” into some icing sugar (not to much). Don’t do this for the next waffle, do this for the next next waffle, and so on. Ps : it’s a little bit dirty then… Sometimes the icing sugar gets dark… That’s why you don’t have to do this for every waffle you cook. Result is better until 15 waffles. After that it becomes hard to not have dark brown sugar… But these 15 waffles will be like HEAVEN. Superb! I can not rave enough about these. I was recently turned on to these on a cooking show and thought I must try. Long time fan of “true” Belgian yeasted waffles but these were a different take. I check your site an voila! there is your recipe. I think we have died and gone to heaven. I spend a tremendous amount of time at a local cooking school working with yeasted breads and a wood fired oven. The owner and his wife were actually instrumental in starting the KAF baking catalog. We have guest chefs, well known, in the art of yeasted breads. These waffles rival the artisan breads and deserts we make. I can not wait to share these with our class next weekend! We are teaching a french bread class…close enough to Belgium…dont you think! Oh dear, I hate to be the un-Smitten killjoy, but this recipe did not work for me at all. Soooo disappointing! I let the dough rise at room temperature yesterday, followed by an overnight stay in the fridge. In the morning I let the dough soften enough to be kneadable and added in the Belgian Pearl Sugar (Lars brand from Amazon). The results were something like externally caramelized hockey pucks (well, slight exaggeration). Most of the sugar crystals inside either absorbed into the dough, coated the outside of the waffles, or remained white sugar bits within them. I do not have a Belgian waffle maker and used my “regular” one, so the many waffle indentations are by necessity shallower. Would that affect the density of the waffles? I put them straight from the waffle iron into a 200 degree oven, all but the last few, but this did not seem to matter. I experimented with five minutes, six minutes at a lower temp, and other time/temp. variations as well. Yes, the yeast was fresh–it bubbled, and the dough rose as it was supposed to. Just reread some of the comments, especially the one about a regular waffle iron making thinner, denser waffles. Now I fear my waffle iron is the culprit, and I suspect a second waffle iron is in my future. Hi Lauren — Since I usually have the dough hook on, a low speed. Yes, it can take forever. Oh boy, KitchenAids! Don’t get me started. Okay, get me started. I had a 5-quart basic Artisan for years. Loved it. My mother’s 20 year-old one was dying, so I gave it to her, and upgraded to a bowl-lift Pro. Hated it. Felt the bowl lift made it no easier, if not harder, to get inside the bowl and just like you said, didn’t get everything up from the bottom of the bowl. I even tightened the adjustments, did nothing. Oh, and it turned out the paddle and hook weren’t dishwasher safe (this was NOT made clear) and so they became corroded and wrecked. And I realized how much I didn’t need a 6-quart; in fact, I found it quite ineffective for the small-batch baking/testing I usually do. A year of mixer annoyance later, about six months ago, I cut my losses and bought a new 5-quart Artisan mixer (with dishwasher-safe attachments) and all has been well since. But it was an expensive mistake, the kind of thing even with my cooking being a “business” I could barely justify. And frankly, I’m glad I never allowed them to send me any free ones (kind and tempting as the offers have been) so I can speak truthfully about it when asked. :) And thank you. These waffles are the bomb … the best … amazing … yet … a few notes … DO NOT attempt this in a non-removable plate waffle iron … it makes a hot sticky mess … yes … the note above to put a wet paper towel in to soak it all up might work … but there is WAY too much of the pearl sugar in the dough to get into the waffle and not all over the extra room there is to spread to … that said … I would try these again with perhaps a demerara or muscovado sugar on the outside of the dough ball before it jumps into the waffle iron or some sort of finer than the pearl sugar coarse sort of sanding sugar … yes … will report back the findings … still trying to eat through the first batch after having shared with friends here and there!!! Thanks for a fabulous recipe Deb!!! I have to tell you, that when I read your description of those waffles my thoughts were in order 1) OMG, that will be so nasty to clean out of the waffle iron. Hi! I just discovered your site about a year ago, and I love it! I’ve acquired a great reputation around work, too, because I always have to share the love by taking the baked goods out of my home!!!! Anyway, we’ve been making liege waffles for years, but limit them to special occasions (amazing how routine events suddenly become special occasions as an excuse to make these waffles!) I, too, crush up sugar cubes when we don’t have pearl sugar in the cupboard. It works well when you’re in a pinch. Here’s another tip for those who, like me, are too frugal to buy a new waffle iron and are stuck with the stuck plates. After letting the waffle iron cool a bit, use the hottest water you can stand, saturate a dish rag and wrapping the hot, wet rag around a chopstick, go after those channels! It helps, too, if you rewarm the iron if things have gotten completely cooled and rock hard. I have to admit I didn’t have the time this morning to wait for the rising time, so I used the Allrecipes.com recipe that requires less rising time. I’ll plan ahead and try your overnight rising method next time! Thanks for all your fabulous recipes and tips! Hi! I just made these, they turned out excellent. The next time I’m making these I’ll be short on time the day before. Do you think it will work to let the dough rise in the fridge for two nights? Thanks! Rita — I haven’t tried it over two days in the fridge, but in most cases, it’s usually fine. Made these today with the Swedish sugar and a regular waffle iron and they were still one of the most incredible things to ever come out of my kitchen. I didn’t press the lid too hard down on the waffle iron so they remained thick. Seriously so amazing. And less messy than the gingerbread waffles you posted in December! I just made the dough. Don’t own a mixer so did it by hand. It did take about 20m to work in the butter but it sounds like those with mixers also had it take that long too. Will report back – I really hope this recipe works out as I looove liege waffles. I finished those last night and we had the two first ones still warm. I know he originals and they are aupposed to be very sweet, but I thought this version was perhaps a tiny bit too sweet. I would adjust next time. Thank you very very much for the recipe though – with the exception of too sweet for my taster hear were delicious and the recipe works. Oh, my. I haven’t made lièges in years, and my fiancée hounds me for them. These are, hands down, my absolute favorite, most nummy waffles to make. I just made these this morning ( made the doigh yesterday morning) and they are simply wonderful!! what a great recipe, well worth the wait and time. I made them using my very cheap and basic waffle maker, it just takes a bit of time but the result is fantastic. thank you for this recipe!! I bought my pearl sugar at wafflepantry’s site. I got a huge bag of the real deal for a good price. I just made your waffles this morning and they were perfect! Just an update. This time making the recipe, I made the pearl sugar using the stovetop method you referenced. And I also put all of your ingredients together using Cooks Illustrated no-knead brioche technique. I think it turned it out great. Of course, I’ll probably just use my stand mixer next time. For some reason having to turn the bread every half hour is actually more difficult for me to remember. Anyways, the sugar was not quite the same as Lars, the lumps weren’t all the same size and some of the lumps tended to fall apart. But the sugar, on the whole, worked okay. This post inspired me to get a waffle maker. Never having had fresh waffles before these were mind blowing. All the comments about the dough being like brioche led me to experiment with other bread doughs (such as challah) as a base with pearl sugar as per this recipe. I have found that your recipe for Sally Lunn bread works quite well. Essentially a light brioche, and ready to waffle in an hour! I made these this weekend, and they were delicious. I sourced the sugar from Germany, but next time I’ll have to play with alternatives. There will definitely be a next time :). They came out a bit more buttery than I remembered, very rich. I used my bread machine’s dough cycle to make the dough, and it worked perfectly. I just softened the butter beforehand, and also whisked the eggs before adding to the bread machine. I have a very cheap bread/waffle grill with removable plates (snackwich). Afterwards I just rinsed it with boiling water, and then into the dishwasher. No mess, no fuss! I’ve made gaufret liege before, bit this seems a nice and simple recipe, I’ll try it tomorrow. I’ve tried the sugar cube trick, but the texture is wrong, as is the Swedish variety, hail sugar seems too hard. Pearl sugar is soft enough to crush with some effort. I’m trying trying spinning some rough “sugar in the raw” cubes, which seemed softer, in the food processor. I’ve made this recipe twice and it came out well both times! Didn’t have Pearl sugar so I used the DIY method of cooking the sugar with a bit of water. I don’t know what the original recipe tastes like but this DIY pearl sugar tasted fine even delicious! The second time I made it I actually froze the dough after letting it rise for two hours. The day I wanted to make the waffles I took the frozen dough out of the freezer in the morning and then an hour before cooking I let the dough rest at room temperature. Definitely sacrificed a bit of dough quality but I didn’t miss it too much. Still absolutely mouth watering! Without reading every last comment, my experience with King Arthur Flour Swedish pearl sugar is that it is specifically meant *not* to melt which was discovered too late by this perfectionist baker. Still plenty tasty, just more like a pretzel in a waffle shape and sweet. My daughter declared it her best breakfast ever; uh-oh. For pommes frites and waffles around Boston, go to Saus. You’ll roll away happy. (See also: fried Brussels sprouts). Great recipe, I am so excited to try it! It also seems like a trip to Belgium is quite necessary! To get the waffle iron clean I do wonder about a little steamer that might lift the burnt sugar right off. I am going to try this recipe this week for the gluten eaters at my house. Made some for breakfast this morning and WOW. First off, way easier than I thought. When a recipe uses yeast, has a two-step proofing process and needs to be done a day in advance, I all but cast it off. But I’m so glad I didn’t! Used kerrygold butter (I don’t know much about butter, but the texture seemed noticeably different), roughly chopped into 1/2 T pieces, cold (not RT) eggs, and mixed everything by hand in a large metal serving bowl– butter incorporated evenly, 5-10 minutes! 2 hours at RT followed by 10 in fridge, baked off in normal/shallow waffle iron. VERY messy but after unplugging iron, found that a fork tine works well to ease the caramelized sugar out as it has slightly cooled– that’s the beauty of 14T of butter. No sticking! :) Deb, this is an awesome recipe and surely a keeper. Thank you! How well does this dough freeze. I’m single so I want these one or two at a time. Can I freeze these individually, pull them out the night before and have a waffle in the morning? If so, I am 5x the recipe. I’ve been eyeing this recipe since it was published back in May 2015. I finally made them today. I think regular batter-based waffles may now forever be the lesser waffle to me. I was able to find the pearl sugar at a local, slightly upscale grocery, but I’m considering trying to make my own maple pearl sugar or pearl-like sugar for the next batch. The one thing I did different is switch to the paddle attachment to incorporate the butter after the first couple of additions. It went a lot faster than trying to use the dough hook. I did switch back to the hook after I added the last of the flour for the five minute knead. I got the waffle maker you recommended for Christmas because I love the idea of he removable plates. I got the Belgian pearl sugar. I waited for the perfect day, today! I wondered for awhil why my dough was so brown. At the end of the process of adding all the butter, I realized why – I had use King Arthur whole wheat flour! It seemed to be rising rather nicely, even outside the proofer, but I was too scared to waste that expensive pearl sugar on 100% whole wheat flour. I didn’t think it would rise enough in the end. Into the bin it went, and my new batch is napping in the fridge for the overnight rise. Wish I had something to do with that whole wheat dough, but no sugar! So I cut my losses. Can’t wait to finish these waffles in the morning. Thanks for the recipe. In 1979 my parents moved our family home from five years in Brussels, Belgium, ripping me at the tender age of ten from real bread and waffles to the land of wonder bread and lies. There’s no other way to express the shock I experienced. Today I made real Belgian waffles in my own home on my own brand new waffle maker (same as yours, thanks for the recommendation, love it!) and … Just … Thank you. My home smells so perfect, and the waffles were very, very good. I think next time I am going to try them with actual sugar cubes because I think that’s closer to how I remember them, but the pearl sugar was lovely. Thank you thank you thank you. Are you A Gay Or Lesbian That Need Partners To Satisfy With A Financial Reward. I cant find pearl sugar anywhere. Can i just use raw sugar instead? I’m not sure if this is asked before but… If we follow the countertop-first-then-fridge approach, should we let the dough come to room temperature before we knead in the sugar and shape them? Yesterday I tried to make a liege waffle recipe and it refused to come together. Then I remembered, smittenkitchen has one too! Whilst making the dough I was waxing poetic about your site to my husband, how I never need another site, how intelligent and hardworking you are, how you give us the best of the best… This happens a lot around here. Thank you Deb! Me again. Yes, my question was asked before! Room temp first, then in the fridge method: take your dough out of the fridge 30 min./ 1 hour before pearl-sugaring and shaping them. Otherwise the dough will be too cold/too firm, as stated by Deb (comment 97) in response to Francesca (comment 86). Made these for my daughter’s birthday and she said any time I feel like cooking, I should make them. Fabulous, even cold. I used sanding sugar in place of the pearl. I’m not sure how they compare, but I look forward to further explorations! Thank you. I was delighted with how these came out today. I don’t keep milk in the house, but added buttermilk powder to the flour, and more water to the water. Also didn’t want to order pearl sugar or wait for it, but it was easy enough to make myself (see http://www.whilehewasnapping.com/2015/02/how-to-diy-pearl-sugar/). I made a half-recipe – eight waffles – hoping the six we froze will be just as good when we reheat them. My waffle iron doesn’t come apart, but hot water and a nylon brush cleaned it up pretty quickly. Wow! You bet its a mess to clean out! I just finished making them and they taste awesome…but cleaning it in between was difficult. I found using a double layered paper towel, placing over the waffle grits and using a chop stick to go in between and lift up the left over worked great. Worth the mess! There’s a delightful Scandinavian candy shop on Christopher St. Sockerbit that carries pearl sugar. I read through this recipe and decided to wing it – I used a sourdough waffle recipe from my home state of Maine that also proves overnight and then added chopped up piloncillo (raw evaporated sugar cane from Mexico) to it in the morning with the eggs and baking soda. SO. GOOD. These are going in the regular rotation! Made these this past weekend. OMG. So so so good. I finally like my waffle iron!! Oh my god, yes… what is UP with waffle makers? Who can actually clean those things by wiping them with a sponge? Seriously? I’ve looked high and low for people with a better way of cleaning them than I currently have – which is to use a damp paper towel to clean every little crevice, then go back over it with a dry one. And I have to do this every time I make waffles. Argh. This is why I will never subscribe to the “will if waffle” mentality – sure, it may be cool to cook a frittata in your waffle iron, but the cleanup!! I made these this morning…Fantastic! Thanks for sharing the recipe! I still need to clean the waffle iron, and I think if I want to keep making these I will need to get one w/ removable plates as well! Your recipes have never failed me– or should I say I have never failed your recipes… Until now. I did everything according to your directions and came out with hard, dry waffles with intact chunks of sugar. They hurt my teeth in more ways than one! I ordered Lars pearl sugar specifically for this recipe. I really want to love these waffles. I have a few balls of dough left and I’m considering picking out the sugar chunks and using the syrupy residue left on the waffle iron as caramel for the next batch– Otherwise they are too sweet. Any tips? Where did I go wrong? Jennifer — Yikes, I’m sorry it didn’t work. Did it seem like they took too long too cook and they might have dried out and hardened from being on the waffle iron too long? They are supposed to be crisp outside, but stretchy inside. They’re not like a cake waffle at all, of course. I just made these today. Flavor is amazing but they came out really dense? I’m wondering if I’m reading the directions incorrectly. After kneading, don’t I also need to let the balls rise again before cooking? Sorry for being so confused! I am finding myself in a similar position to Serena’s. Namely, it seems like there’s a step missing if you do the room temperature rise first and then the overnight rise in the fridge. The dough that is sitting on my counter is cold and hard and I can’t imagine that I’m going to be able to knead in the sugar at this point. There must be a step missing where if you do the fridge rise second, then the dough has to sit out for, what?, an hour to get to room temperature before you can knead in the sugar? Which makes sense, because if you do the fridge rise first and then the room temperature rise, your dough would be warm and soft, not the cold, hard, dense dough I have sitting here. Oh wait, I see that this is addressed in comment number 97. It would be super helpful, especially for those of us who do not usually work with yeasted dough, to have this important step noted in the recipe. Thanks! Alright! So I just tried this today! A lot of work…to mix the dough with a spoon (didn’t have the machine). Also, did not have a waffle maker :( I tried making it in a George Foreman grill ahaha, did not work that well. It got super dry in the center and would not cook fully. Now I have dough left :( ..might just make biscuits out of em! Any ideas? That is a lot of work to make the dough! I made my waffles in a George Foreman with waffle griddle inserts. I had to keep it on high/medium-high in order to get the caramelization. Since the grill doesn’t have the “lock” that many waffles irons have, I smushed the dough down when I put it on, and then pressed down on the lid when I closed it – that seemed to work well enough to spread the waffle out and get the middle cooked. These are wonderful. Quickly became a fan favorite in my house. It seems like too much sugar when you mix it in, but it’s just right – the crisy carmelized sugar makes them extra special. A few of these waffles, paper-wrapped snd tied with pretty ribbon, make a wonderful gift . . At a fraction of what it would cost in a bakery in France. Hi. My waffles turned out to be very biscuit-like. The interior wasn’t fluffy and soft. Do you happen to know what could be my mistake ? Hazel — This isn’t a particularly fluffy waffle, but if it was just plain firm, a tiny bit less cooking time will help next time. These should be dense and stretchy inside and caramelized with a glossy crisp outside from melted sugar. Thks so much! I tried again with lesser cooking time n they tasted just like those in Belgium! 1. I found my recipe for these waffles in a magazine years ago, when i finally got around to trying it I had trouble finding the special sugar so had to break up the kind i did find (about the size of chickpeas–much too large), and was underwhelmed with the result as i had fantasized that i might finally have found a niche treat i could make a fortune with at the Farmer’s Market. Havent made them since after researching food-selling requirements at rhe FM, but will try yours for my own pleasure. 2. Search online used item sites, garage or estate sales, thrift stores for a large heavy waffle iron with removable plates–my Mom had one in the 1940’s-50’s, but it is probably not dishwasher-safe as it is not non-stick, but occasionally you will still find them! Can’t understand all the comments about cleaning the iron as being so difficult–just lay the plates flat, pour water on them and let it sit long enough to dissolve the sticky, then use a soft brush to scrub it away. The brush will be dedicated to this chore, cleaned and dried for the next use. I made these yesterday and my friends went wild. I served them with fresh fruit, lemon curd and whip cream. They are divine! I would love to see a recipe for waffles with natural yeast (not dry yeast). Your recipes sound amazing, but I made the switch to natural yeast recently and I love it. Best waffles ever! Found the pearl sugar for $5 at Whole Foods. We made them with the overnight refrigeration first and the several hour rise in the morning and they were perfect. They were equally delicious plain with a dusting of powdered sugar or with a drizzle of Nutella. Thanks for the great recipe! I live in Brussels and just moved to a new neighbourhood. I just realised the nightly ice cream van with twinkling music that goes down my street is actually a gaufres and ice cream van. My first post here….but I have been a major fan for ages….I love everything about smitten kitchen…really enjoy experimenting with new recipes….was very intrigued by the idea of the liege waffles….made them yesterday and today….very tasty…easy to make…but my advice to fellow experimenters is DO NOT make these in an iron without removable plates..clean-up in a Belgian iron was painful…I did make some in an non-Belgian iron and that worked fine….also…I did not love them as much as your essential raised waffles and am pondering whether one could add pearl sugar to that recipe….because I do love the caramelized shell of the liege, but prefer the lighter insides of the erws……any thoughts? anyhoo…thanks for all you do….I have had so much joy with your recipes and humor and shots of your lovely family…really enjoy the newsletters! These were at least as good as I remember from over 15 years ago in Brussels and other places, after first having bought one without any idea how little it would resemble waffles from my aunt jemima past. I was blown away then and now, now with the added bonus of having pulled it off in my own kitchen. Thank you for the comment about the incorporation of the butter taking forever … I knew to be patient. And with wet towel in the hot iron worked beautifully at cleanup time. Amazing flavor and textures and really quite a simple recipe. In case you were wondering, these work great in a regular, non-Belgium waffle iron, but they’re so thick I had to weigh mine down with cans because otherwise the waffles wouldn’t cook in the middle. And you were not even kidding about hot molten sugar. Ouch. Do you have a suggestion for incorporating sourdough starter into these? I’m new to the sourdough thing but have tasted liege waffles made with sourdough starter and they were to die for. Your recipes, btw, are the go-to in my house and I’ve never been disappointed. Thank you, Deb! The only comment that mentions using sourdough (but not a ton of details) is here. I’m having friends over for brunch this weekend and can’t wait to try this! I’m planning to do the room temp rise first, then in the fridge overnight. I realize I need to let the dough come to room temp for about an hour before kneading in the pearl sugar, but one question–do you knead the sugar in by hand or do you use the dough hook on the Kitchenaid again? I don’t want to overwork the dough with the machine, but it seems like it might be hard to do by hand with those pearls of sugar. You can do either. I think I did it by hand, but I’m loath to take out the KA for any small task. Oh my goodness these are amazing. I just made my first batch. My yeast was a little old so I didn’t get quite the rise I wanted, but that’s my fault! Very easy recipe to follow, great results. If you tried to make this without a stand mixer you’d probably want to kill yourself. I think it’s too much pearl sugar (I was using the real deal holyfield). I will scale it back 1/3 of a cup the next time and i’m thinking I can get away with even less. Pearl sugar is expensive so if they can be made with less, that’s great. And if I delay type II diabeetus by a few months, that would be lovely as well. On my waffle maker, I got best results with 1.5/6 heat for 10 minutes. The first ones I made were on 2.5/6 for like 5-6 minutes and the pearl sugar didn’t burn but it also didn’t have time under heat to soften. Result was waffles that had great color but slightly harder than desired and pearly sugar that was too hard. The 1.5/6 heat for 10 minutes were stiff to break but still soft and and a lot of the sugar melted but still had a slight crunch. These waffles are delicious! I had never tried liege waffles before, and my family and I were delighted with them. The recipe was easy to follow with a Kitchen Aid mixer doing the hard work. I took an uncharacteristically (for me) Zen approach to adding the butter and then letting water do its slow magic to melt the burned sugar off the waffle iron (no removable plates on mine). These were relatively “hands off” activities, so I didn’t mind how long they took. I made my own pearl sugar, following your link, and it worked just fine, though I think I would add less sugar to the recipe next time. Thanks for introducing us to this great recipe. Oh my gosh, this is the first recipe from Smitten Kitchen that didn’t come out perfectly. I think I ran into issues on two fronts: (1) My old waffle maker from college just didn’t do the trick. It cooked much too quickly so the outside was crunchy & dark but the inside was not cooked through. And (2) I used Swedish pearl sugar which did not melt – it remained hard, white and crunchy. From another commenter is sounds like there is a difference between Belgian and Swedish pearl sugar? I still have about half the dough in the fridge, is it possible to turn it into a brioche knot type roll and bake in the oven? And a new waffle iron is definitely on my wish list now! Can you try a lower heat? That said, this is supposed to be fairly firm waffle on the outside, stretchy inside, but the outer crunch is often from the sugar as it melts. I did learn in the comments here that there are pearl sugars that do not melt — was the taste distracting? My waffle iron is so old it only has one setting: on/off! Definitely time for a new one. There are these amazing liege waffles here in SF and while they are quite dense (with wonderful stretch inside and crispy caramelized sugar outside), they still have some “give.” That’s what I was going for. I really think it’s my waffle maker. Who knew there was a difference?! I actually did go ahead and bake the remaining dough in knots in the oven. 350 for 30-35 minutes and the results weren’t half bad! As described in the linked website, the Swedish pearl sugar inside disappeared into the buns, but outside it remained sprinkled on top for a pretty effect. I did try your recipe. The waffles eneded up with hard and almost biscuit like texture. I was looking for soft and chewy inside liege waffles. I believe your recipe has more flour and less eggs! I may try it next time with 3 eggs and only 3 cups of flour. It might become more moist and stretchy! What do you think? And thank you for the recipe. P.s: It might also be my waffle maker that was too hot and cooked the waffles fast! I am an extreme waffle lover but after wanting to make these for so long I was so disappointed. To me they were like eating candy and extremely high calorie candy at that. They were so incredibly sweet that I felt the flavor got lost in all that sugar. I will continue to make my old stand-by, sourdough waffles using starter. Oh well, at least I can say I’ve tried Liege waffles. If I ever go to Belgium I will be willing to give them another try. Maybe I just don’t have the knack. I fear I am going to have to try these again sometime. They turned out too yeasty-tasting, and too sweet. I will try with a little less yeast and a little less sugar. The ones in the picture did not have as much pearl sugar showing on the outside as the ones I made. Baking them for 6 minutes on medium/high in my waffle iron resulted in uncooked bread dough in the middle, and 8 minutes at a little higher heat gave me a burnt crust. I was hoping for a buttery caramelized outcome; I’m not there yet. Have my first batch on their first rise as I type. Forgot to have hubs pick up more flour before he took off with the car so we’ll see if substituting bread flour for that last cup has any adverse effects…. worst case we can have breakfast OUT tomorrow….!! 1) if I’m using the fridge first method, can I knead in the pearl sugar after the dough comes to room temperature then let it rise for 2 hours? 2) if I can’t find pearl sugar can I use regular white sugar instead? If so when should I incorporate the regular sugar? And how much should I use? 1. Yes, that’s fine. That’s about the high limit of how long I would leave it in for. Longer than that and the pearls will dissolve. 2. The taste and texture will be altered by using regular white sugar. I would recommend not doing that. I had to buy the Belgian pearl sugar online, as it’s scarcely available. Just finished these, and for anyone planning to make them, here are the notes I made to myself for next time: 1) The batter never got “glossy” in the mixer (still lumpy and dull-looking), and I had to add a lot of flour to keep it from being really sticky while mixing in the pearl sugar, but it worked out anyway. 2) By the time the fifth (of 16) waffle was done cooking, the substantial sugar left behind was turning black and the edges of the waffles were tasting very burnt (not in a good burnt-sugar way), so next time I’ll cook much bigger ones (5 or 6 instead of 16, to divide later), and maybe even take a break partway through to cool the iron and get the burnt sugar off before finishing the rest. Overall, though, very tasty and worth the time! I made this and it came out really well. Thanks for the very detailed and clear instructions. Hi! These have become a brunch staple in our house! I like to let it rise first at room temperature – could I knead in the sugar then? That is, before putting it in the refrigerator overnight? I bake them the next day and a cold dough is so much harder to knead than room temp dough. Thank you! I’m wondering if this is a form of the waffles they serve at Storyteller Cafe in Disneyland and other Disney restaurants. I have been after that recipe for years! Normally waffles wouldn’t interest me that much but once I took a bite of theirs I found myself eating stacks of them, and nothing compares to their dense yet light, chewy, crisp caramelized goodness. Their waffles are like crack, insanely good, but I have a feeling I’ve found their match! There is a Disney cookbook from the contemporary resort that has a waffle recipe I’ve been meaning to try. I’ve been making the top of the world pancakes from that book for 25 years And they’re just as special tasting as they were the first time I tried them in the contemporary resort when I was 10 years old. My husband is OBSESSED with them and thinks I’m a magician for knowing how to make them. For Christmas this year I had given my college age son his first KitchenAid mixer, a bread baking book and your cookbook. I’m thrilled that he called (well, actually he texted but anyway lol ) to say he’d found a couple really interesting recipes from “The Smitten Kitchen”! This guy of mine already has some crazy skills in the kitchen and I couldn’t be prouder! Can’t wait to impress him with these fab waffles next time’s he’s home. what if i dont have a standing mixer or dough hook ?? These were super good! Despite feeling like I must be doing something wrong a few times, they turned out great! Definitely not your everyday waffles, because of both the time to prep and the sweet richness of them, but they are a fun, delicious, fancy waffle. Thanks, Deb! The dough for this recipe was on point, but I almost wonder if there was a typo for the amount of sugar, because it was way too much. The first time I added the full amount (1 1/3 cup) and the waffles were overly caramelized and had too many undisolved pearls. I reduced the sugar to 25% and they came out prefect: hard on the outside, chewy on the inside, and with pops of sugar. I would start with 1/3 a cup and go up from there if you really think you need more sweetness. Do you think I can do two room temperature rises in the same day instead of the overnight fridge rise? I want to make horse for an evening event and start in the morning. That should be fine. Even one long rise at room temp would work. Do you think I can do two room temperature rises in one day instead of the overnight rise? I’d like to make these for an evening event and start in the morning. 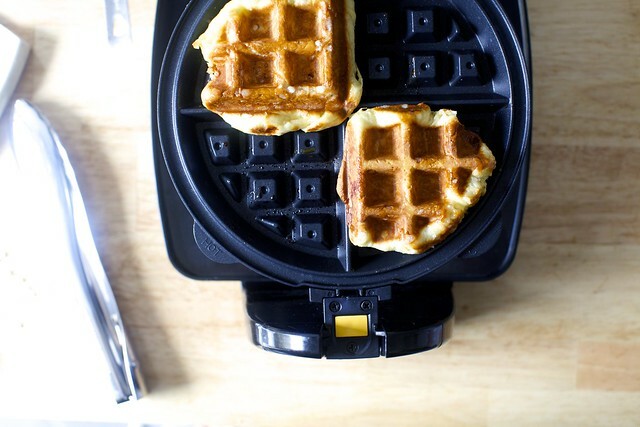 Hands-off clean waffle iron by sandwiching two layers of wet paper towel and leave overnight. Works for panini grill too. Hi Deb. I made these and while they were absolutely delicious, I only got 8 four inch waffles out of the dough. I was aiming for 16 to bring to a breakfast potluck, but I don’t know why I only got half the amount of what you specified. Everything was measured and weighed exactly as per your recipe. Maybe it wasn’t proofed enough? I did use instant yeast instead of active dry, but I let it rise longer (2.75 hours) and it was definitely doubled in volume and then some before sticking it in the fridge. I don’t even think underproofing would cause the dough to produce only half of the intended yield though. Any ideas? Thanks! I was so excited to make and eat these waffles. I just made the dough last night and cooked up the waffles today. They are rock hard, which is super disappointing after so much work and time going into this recipe. I did the room temperature first and put the dough in the fridge. I took the dough out of the fridge and immediately kneaded in the pearl sugar. I’m wondering if I should of let it rise out of the fridge for another hour or so before adding the sugar?? But I followed the recipe, and I’m thinking I should of let it rise again. My waffles were flat and hard. I’ve had Liège waffles many times before, and this was a major disappointment. Such a waste of time both making the dough and cooking the waffles. Mine turned out disappointing. Very chewy, not fluffy at all. Not at all like any liege waffles I’ve had before. I think there was an issue with the yeast I bought, or maybe the area I left the dough to rise in was too cold. It probably didn’t rise enough, I also made bread that same day and it wasn’t good either. Belgian waffles were a big hit at the 1962 World’s Fair in Seattle! I know I was there! New York is not always the leader, sorry. Thank you! I’m so excited to try this out! For room temp rise first, do you need thave let the dough come to room temp before incorporating the pearl sugar, or just go straight at it from chilled? Made the dough last night after a couple glasses of wine and took dough out of the fridge this morning. Apparently I forgot to add the yeast! Now I am making again, and had a thought about the butter. What if you incorporated the butter into the flour while cold, using your fingers until flour has pea like texture, like making pretzels? I am too far into it at this point, but will definitely try that next time. I can’t wait to eat this! Lol, I don’t like them either. But I’ve found that with basic pancake-like batters, it’s very hard to get a crisp waffle because the machine is such a steam trap. Regardless, I’d rather eat these. THANK YOU! Wow, just wow on these waffles. I have been dreaming of waffles like this since I had them in Berlin, of all places made by a Kurdish man. I made these today for brunch with some girl friends and it was such a hit. I can’t wait to make these again soon. A friend made these waffles for me over the summer and it was love at first bite. I followed this recipe, carefully I thought, but the waffles came out super dense. It did double in size with the first rise on the counter but there wasn’t much flavor there. I’ve never had a recipe from Deb that didn’t work out for me so I may have to try this again. These waffles are usually on the firm side when they’re cold, but they should be eaten warm. Part of the magic of them is what happens after you cook the first and second waffle, which is that some of the melted sugar is left behind, and you can more and more burnished, glossy edges like you see in my photos. Did you get that at all? I have to echo Maryam Ali here. For some reason, the wagfles came out dry and with a distinctly biscuit-like texture. Is there an easily-diagnosable error I’m making with this recipe? Because the pictures and descriptions are AMAZING! Deb can I use bread flour in place of ap flour? You can, but there’s no need to. I made these with regular flour the first time an they were amazing! I’m trying them with gluten free flour and they have 1.5 hrs to rise still. Ts and ps appreciated – I need these to work! Hi, Deb! What happens with the extra 1 c of flour? Can you freeze some of the dough for later or do you have to cook into a waffle and then freeze?